Home / Getting Started, Getting Started / What is the app ID/app publish ID? What is the app ID/app publish ID? There are a few different types of IDs listed in the Helpshift Dashboard, each with its own set of use cases. Those ID types and the differences between them are listed below. You can find the app ID for each of your platforms by navigating to the Settings > SDKs (for Developers) page. 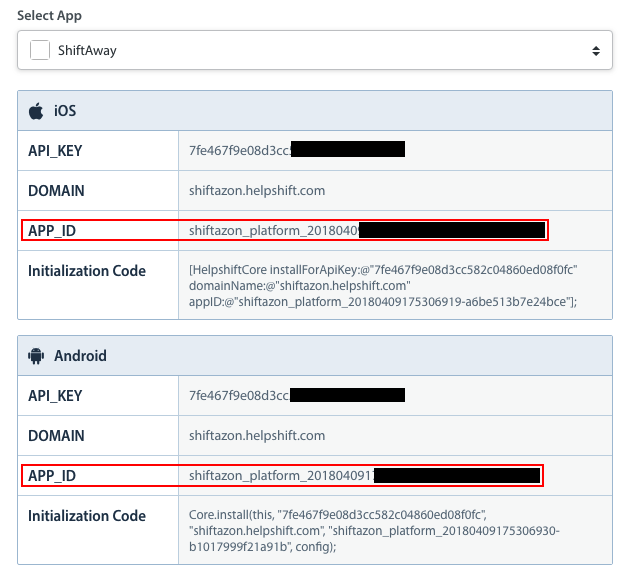 Use the ‘select app’ drop-down to pull up app IDs for different Helpshift apps. Your App publish ID can be found on your Settings > App Settings page per the screenshot below. You can use the app ID or the app publish ID to pass information through our REST APIs, such as for redaction or data portability requests. The publish ID for web and email can be found on the metadata tab on any email or web Issue. Simply hover over ‘Web’ or ‘Email’ and the Publish ID will appear. If you are submitting a redaction or data portability request for web or email Issues, you will need to provide the publish ID for those types of Issues instead of the app publish ID.